The virus seemed different in the vineyard this year. Many vines we had marked as 50% red canopy last year did not meet that threshold this year and some seemed asymptomatic. We had lots of that this year as well to the point that you would have been hard pressed to find a single vine in the vineyard that didn’t have at least some of this red leaf spotting. So what is it? Is it blotch? Insect damage? Fungal colonization at the loci of inset wounds? My first suspicion was mites. Last year was a bad mite year and we had to use chemical control on part of the vineyard. 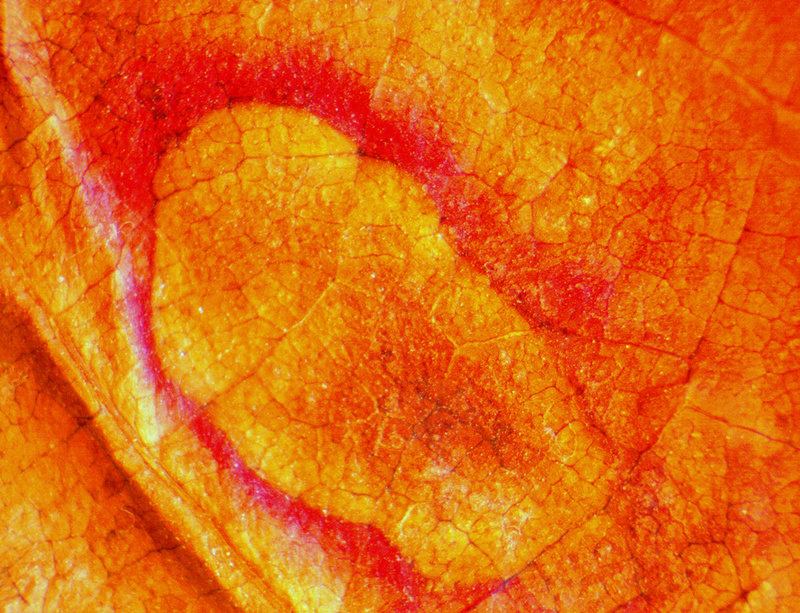 Mites prompt an anthocyanin response from the plants in the form of “bronzing”. Based on that suspicion we used stylet oil as the spreader-sticker in a first ever post pruning dormant spray. (Before the blotch field surveys we really had no sense how many vines had been lost to trunk diseases.) We also used stylet oil in our last fungus spray. Despite being armed with a couple microscopes we found only one mite in the vineyard. It appeared to be a forlorn predatory mite running around. Sticky traps, sticky tape, we expected to find the armies if eriophyid mites Monica Cooper reports finding in Napa. No luck yet. We find mites on the Baccaris outside the vineyard. Well, either stylet oil is just stunningly effective or mites are not the agents, or both. 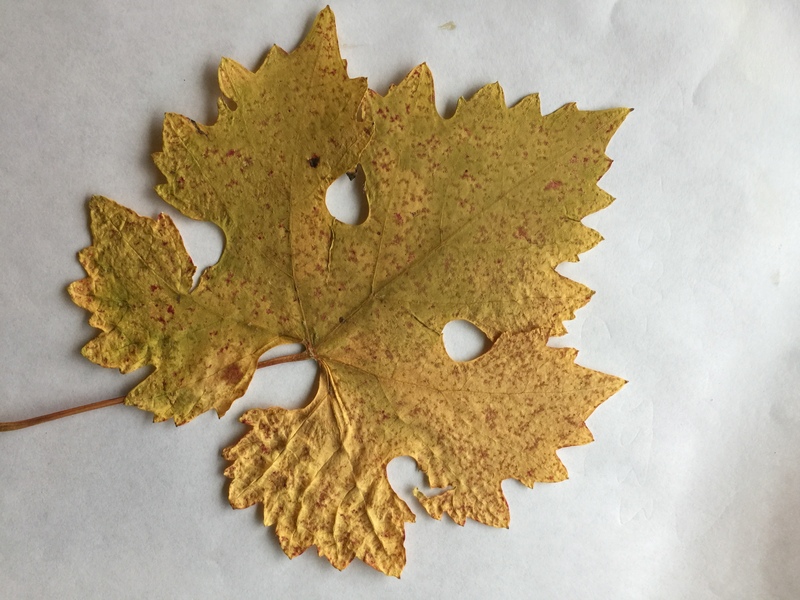 As previously mentioned, nearly every vine in the vineyard had at least some leaves that looked like this. All of the leaves involved in the beginning of canopy crash in late September looked like this. This brings us to Esca. Esca is a poorly understood consortium of fungi that is wreaking havoc in Europe. It involves the genera Phaeoacremonium, Phaeomoniella, Eutypa, Botryosphaeria, Phomopsis, and others. 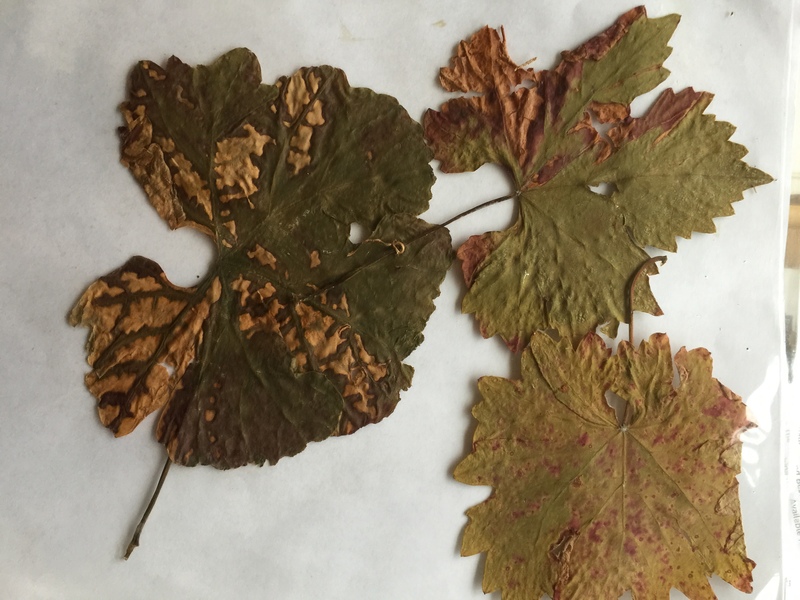 In various combinations these fungi are associated with young vine decline (Petri disease), black goo, Eutypa dieback, and “apoplexy” or sudden vine death. 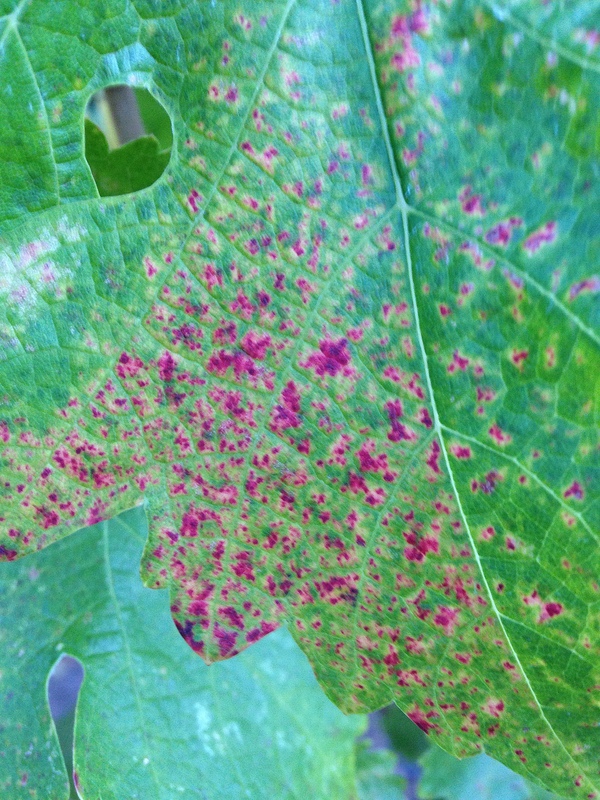 These leaves all show some level of Esca symptoms. Up close one can see a “front” of anthocyanins as the leaf apparently mounts an immune response to the growing Esca patch, or possibly mycotoxins from the fungi choking off plant circulation . So what of blotch and esca? Geminiviridae are known to infect fungi. Could Esca be the vector? Our understanding is so poor that Koch’s postulates are nowhere near being fulfilled for the various fungi even being the causal agents of Esca. Hofstetter et al (2012) report equal measurements of the various fungi in both healthy and unhealthy plants. One thing for sure is that the conventional insect vector search for blotch dispersal has found nothing. Another thing for sure is that the virus has been around since 1940. If its only symptom were a few red specks on yellow leaves like the one a few shots back, it might easily have gone unnoticed. 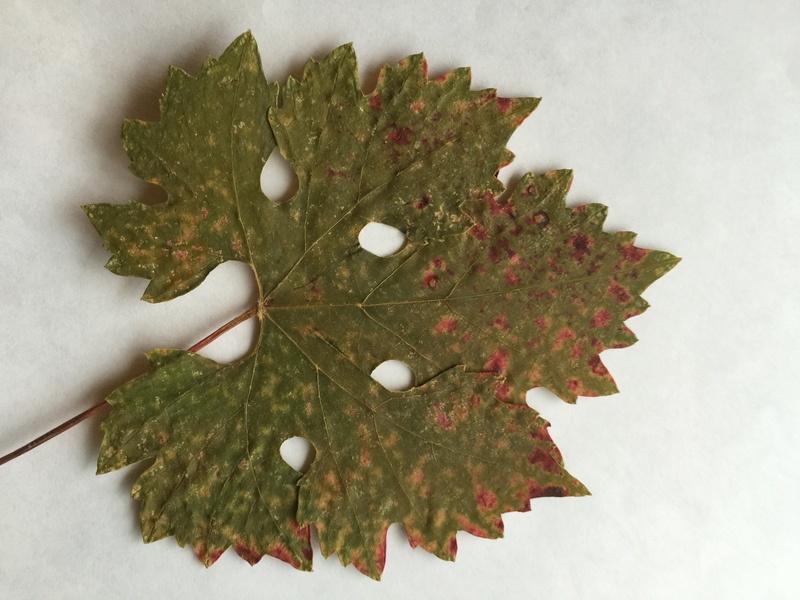 This entry was posted in Biology, GRBaV, Red Blotch Disease and tagged Red Blotch. Bookmark the permalink.